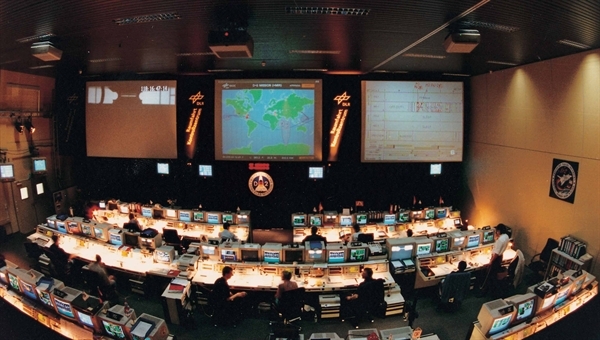 Activity in Mission Control during the D-2 Mission which lasted from 26 April until 6 May 1993. Shuttle Radar Topography Mission (SRTM). 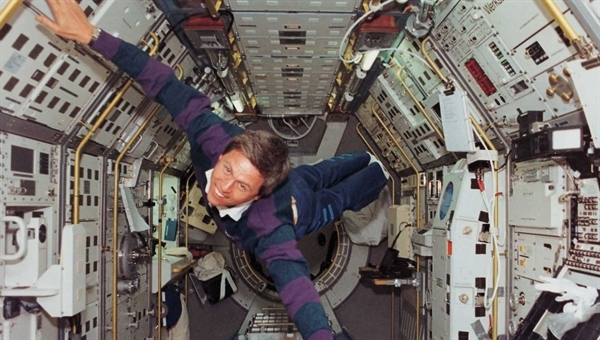 Astronaut Ulrich Walter demonstrates microgravity in Spacelab during the 1993 D2 mission. Radar satellite TerraSAR-X. The launch of the first operational German radar satellite TerraSAR-X is planned for the end of 2006. The German Space Operations Center, operated by the German Aerospace Center (DLR) at Oberpfaffenhofen near Munich, has an impressive track record with many years of invaluable experience. GSOC, as it is known, has been responsible for operating spacecraft for more than 35 years, playing a key role in countless manned and unmanned missions. In recent years, the emphasis has switched to the preparation and implementation of Earth observation missions. Since the year 2000 GSOC has launched and operated the CHAMP, BIRD and two GRACE satellites, while the TerraSAR-X and SAR-Lupe projects (with five satellites) are currently at the preparation stage. DLR is also preparing for its operational responsibilities for the European satellite navigation system Galileo. DLR will be handling the controlled operation of the constellation of 30 satellites for at least 20 years. High safety standards and the ability to interlink a range of complex operating processes are of prime importance in all these tasks. GSOC has an important role to play within the objectives of the German national space programme. It performs international duties (for example in ESA projects, such as operating the Columbus research module on board the International Space Station) and also works with partners (e.g. NASA for the GRACE mission), as well as implementing commercial projects such as those with TV-SAT, DFS and EUTELSAT. At GSOC, commercial, scientific and manned missions are all managed in parallel. The various projects all benefit from the comprehensive capabilities and structures of tried-and-tested multi-mission operations. GSOC organises itself and manages its projects on the basis of experience gained during previous spaceflight projects, obeying the matrix principle. In line with this principle, projects are assigned to dedicated project groups made up of, or supported by, representatives of the relevant technical departments. This distribution of responsibility ensures maximum availability of expertise and flexibility, allowing resources to be allocated according to the demands of the project. For each new project a project manager is appointed by the Mission Operations department, and this manager is supported by the project engineers from the appropriate technical departments. This project group is then responsible for all the work involved in preparing for and carrying out the planned mission. The multi-mission concept firstly ensures that sufficient facilities and personnel are available to prepare for and carry out the mission without running out of capacity. Secondly, it allows many resources to be shared with other projects, resulting in greater operational reliability and lower costs. By preparing and implementing many different kinds of missions, GSOC has been continually building on its experience and expertise ever since 1968. GSOC's first mission was AZUR (launched on 8 November 1969), during which the satellite passed through the Earth's radiation belt. This was followed by two aeronomy satellite missions, AEROS A and B (1970 - 1974). The successful AMPTE mission (Active Magnetospheric Particle Explorer, 1984 - 1986), was the next in a series of near-Earth missions. Between 1990 and 1999 GSOC was responsible for the X-ray satellite ROSAT, utilising the DLR ground station in Weilheim (not far from Munich) and the NASA ground station at Wallops, Virginia. GSOC is currently operating the Earth observation satellites BIRD, CHAMP, GRACE 1 and GRACE 2 as part of an efficient multi-mission operation. Preparations are currently underway for the TerraSAR-X mission with its high-resolution radar satellite, scheduled for launch in 2006. As far as interplanetary spaceflight is concerned, GSOC was responsible for the HELIOS A and B missions to the Sun (launched in 1974 and 1976 respectively). The probes came within 0.28 astronomical units of the Sun (one astronomical unit or AU is the average distance between the Earth and the centre of the Sun). Following the success of these missions, GSOC was also entrusted with supporting ESA's GIOTTO mission, where DLR's 30-metre S-band antenna at Weilheim came into play. During NASA’s Jupiter mission GALILEO, the Operations Centre at Oberpfaffenhofen was tasked with monitoring the Retro Propulsion Module (RPM). Manned spaceflight has developed into another core activity for the German Space Operations Center, which already has over 20 years' worth of expertise in the field. Currently preparing for the operation of the Columbus research module on the International Space Station, it is now the undisputed European leader in this field. During the first Spacelab mission, FSLP (1983), GSOC was linked to mission control in Houston as a user center. In 1985, when the first German Spacelab mission D1 was launched, it served as Payload Operations Control Center (POCC), successfully demonstrating the capabilities and functions of a control center, particularly for European science. GSOC was solely responsible for the scientific aspects of the Spacelab D1 mission, making it the first control center in the western hemisphere outside of the USA to be directly involved in manned spaceflight missions. A new building equipped with state-of-the-art facilities was designed and built at Oberpfaffenhofen for the next planned German mission. The building was first used for the Spacelab D2 mission in April 1993, and was also used for manned ESA missions such as EUROMIR. GSOC took part in another milestone in manned space missions when the Space Shuttle mission SRTM lifted off in 2000 with German ESA astronaut Gerhard Thiele on board. 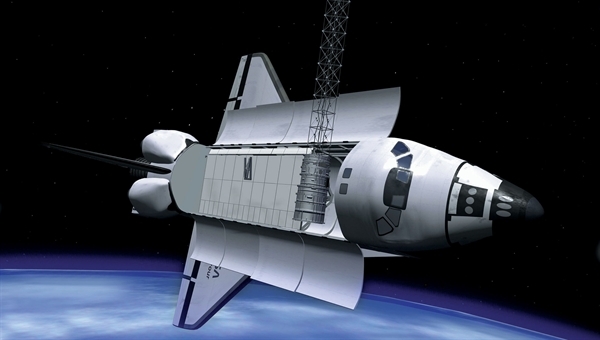 Because of its track record in manned spaceflight, unique in Europe, ESA selected GSOC to operate the Columbus research module, Europe's most important contribution to the International Space Station. Over a long period, the stringent demands of manned spaceflight have resulted in the development at GSOC of a number of new and innovative concepts and measures that have had the effect of enhancing overall system availability and operational safety. This also stands GSOC in good stead for the key requirements of other projects. For some years now, the control teams at Oberpfaffenhofen have also been tasked with controlling and monitoring Earth observation satellites. Since the year 2000 GSOC has launched and operated the CHAMP, BIRD and two GRACE satellites, while the TerraSAR-X and SAR-Lupe projects (with five satellites) are currently at the preparation stage. 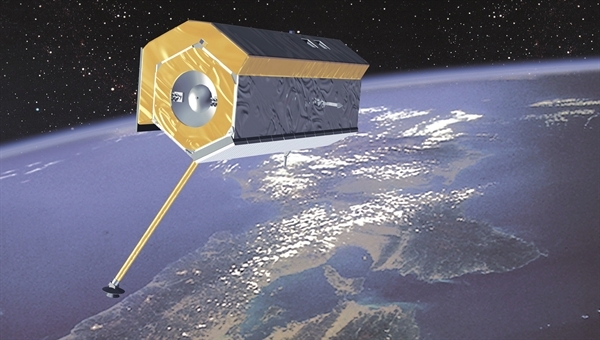 The preparations for the Launch and Early Orbit Phase (LEOP) of the German intelligence system SAR-Lupe in 2002 represented the first occasion on which GSOC was assigned wide-ranging responsibilities in security missions. Future Earth observation missions will benefit from the expertise gained from the operation of numerous Earth observation satellites and the experience gained from satisfying industrial requirements as part of commercial missions. GSOC is aiming to be assigned operational duties for the European satellite navigation system Galileo. If this is successful, it will bring its wide-ranging expertise to bear in collaboration with a number of partners, breaking into a new and economically important field of space activity.